For the sake of simplicity, we will not bootstrap a full Pharo (because that would include preparing for example Morphic to be bootstrapped, or to be loaded/unloaded). Instead, we will bootstrap an adapted version of MicroSqueak from John Maloney, which we re-baptized as Pharo Candle. Pharo Candle has only 50 classes, as you can see in the Github repo, and limited features. All classes from Pharo Candle has a PC prefix, which is not important for the bootstrap, since it will not let be name collisions. The last bootstrap implementation was very coupled to Pharo and its internal implementation. To create objects, to initialize classes, we relied on the existing system, on sending messages, on the VirtualMachine interpreter and infrastructure. So the first step for this new version was to decouple that. Decoupling the existing system from the new system that is about to be created. To do that we encapsulate the state of the new system inside an object, which we call an object space. An object space reifies the new system. It is an object that understand messages such as “create an object”, “translate this string to a string of the new system”, “register this object as a class in yourself” or even “execute this piece of code”. This object space lets us structure the creation of the new system in a more comfortable way. Our next concern, is not installing objects from the existing system into the new system. We want the new system to be transitively closed. So, the best is not to have direct references from the existing system to the new one. The best is to control those references carefully. Then, every time an object space gives you a reference to one of his objects, he really gives you a proxy. That proxy allows you to manipulate, at some level, the object inside the object space. A proxy can give and revoke permissions on the inner object, and make transformations or validations when necessary to keep the model consistent. Since these proxys may perform meta-operations on the new system objects, we end up calling them mirrors at some point. Finally there are VirtualMachine limitations when executing code on the new space. We introduced a new piece in the puzzle to overcome them: our own language-level interpreter. In this particular case, we are using an AST interpreter, but we could, if available, use any other kind of interpreter. The important thing about using our own interpreter is controlling the semantics of the new system, and leverage the VM’s limitations. When the bootstrap starts, there is nothing. There are no objects, no structures, nothing. So we have to build everything from the start. And the question is… where do we start? Our system is composed by objects, and thus, we need to create objects. And every new object may have pointers, which are initially pointing to nil. But what if there is no nil in our system? So, let’s build a first nil, so all objects created later can point to this nil object. As we decided before, we create our first nil object. However, there is a question that arises when we try to create nil. How can we create an object without a class? The answer is, so far, that until we have classes we will create objects without classes. We will not care about their classes and we will solve that later, once classes are created. Fortunately, this problem is present with very few objects. Since we have no class to create nil, we have to specify the format of this object. That is, the amount of memory to be allocated for it, the amount of slots, and if they are pointers or bytes or what. The format is known by the definition of undefined object. Fortunately, nil has no pointers to other objects, except for his class, simplifying the process. We will set nil’s class once we create it later. Creating a class is a complex operation. A class has a metaclass. And it has a name which is a symbol (unique in the system). And it has a superclass, which may have not been created yet. And it has a dictionary of class variables. And… a lot of stuff. Our objective is to keep this bootstrap the simplest. And for that, we will delay all the complex operations to the moment when they are not so complex. In this step we create empty classes. We only initialize their format with a SmallInteger, and we let the rest of their pointers pointing to nil. The first step for creating a class, is to create its metaclass. And to create a metaclass, we need the class Metaclass. This Metaclass, in a ST-80 like model, follows the Metaclass<->Metaclass class loop. That is, Metaclass is an instance of Metaclass class, and Metaclass class is an instance of Metaclass, as shown in blue in the following figure. 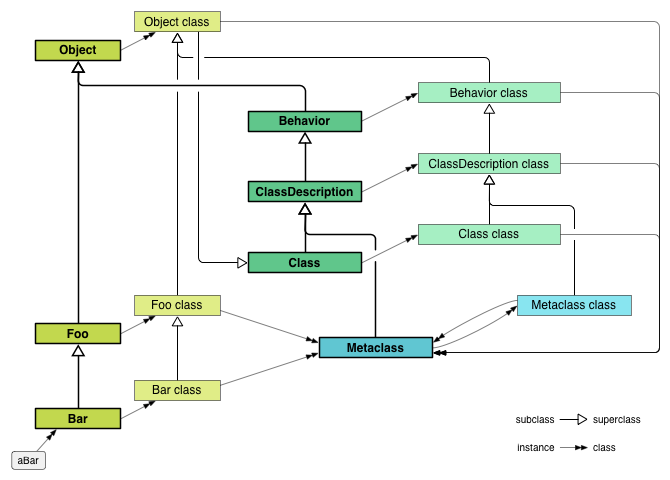 We create the first Metaclass and Metaclass class as objects without class, and then we make each one an instance of the other. Once we have the first metaclass, we can create all the classes. theMetaclassMirror := objectSpace classNamed: #PCMetaclass. newMetaclassMirror := theMetaclassMirror basicNew asClassMirror. newMetaclassMirror format: aClassDefinition classSide format. newClass := newClassMetaclassMirror basicNew asClassMirror. At this point, the classes only have set their format, and their class. All other slots have pointers to the nil object we created at the beginning. Fix nil, create true and false! Now we created all the classes, even if they are empty, we can fix the “classless” nil and create our true and false objects. theNil setClass: (objectSpace classNamed: #PCUndefinedObject). theTrue := (objectSpace classNamed: #PCTrue) basicNew. theFalse := (objectSpace classNamed: #PCFalse) basicNew. Set the superclass of the class. The root of the hierarchy should be nil. Set the superclass of the metaclass. The root of the hierarchy should be PCClass. metaclassMirror superclass: (objectSpace classNamed: #PCClass). After this initial initialization is performed for every class, we finish by initializing the class variables. Class variables are represented by a Dictionary object. A dictionary object is an object with a complex structure, and the way to manipulate it depends on the nature of the system we are bootstrapping. The solution, so far, is to delegate the initialization of the dictionary to the dictionary itself. For that we use a combination of the code of the dictionary and an AST interpreter. An AST interpreter needs to be initialized before its usage so later, all class variables can be initialized. As you can see in the code below, the AST interpreter usage is hidden inside the mirror implementation :). Now we have all classes of the new system created and initialized. We can start installing all their methods. Before, we should declare all global variables of the system, so the compiler knows how to bind them correctly. After that, we take the source code of all methods from the system description and compile them. The compilation gives us as result the bytecode of the method + the literals. This method is then translated to a method in the new world, and installed into the new system. "build the methods as instances of this system"
"create a method dictionary of the new system"
newMethodDict := objectSpace createMethodDictionary: newMethods size. "install a method from this system to the other"
"the translation to a method to the other side is made inside"
"we set the method dictionary to our class"
objectSpace interpreter evaluateCode: 'PCCharacter initialize'. objectSpace interpreter evaluateCode: 'PCString initialize'. objectSpace interpreter evaluateCode: 'PCFloat initialize'. test the bootstrapped system while still living along with the original system, without serializing it. I mean, run it into the same VM without AST interpreter. I hope I explained myself well. This entry was posted in Pharo, Smalltalk and tagged Bootstrap, dynamic languages, internal implementation, languages, object spaces on May 6, 2013 by Guille Polito.